Part of the new Core Knowledge in Orthopaedics series, this new resource provides concise and practical coverage of the most essential knowledge in orthopaedics and sports medicine for infants and children. 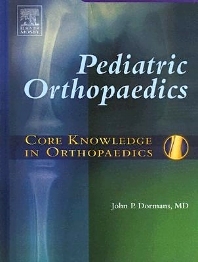 It opens with a review of the differences between the pediatric and adult skeletons, and continues with a chapter covering physical examination techniques for pediatric patients. The book then explores a broad range of individual orthopaedic problems and disorders. Abundant tables, algorithms, and specially designed diagrams assist readers in mastering key concepts quickly and efficiently. Covers all areas of pediatric orthopaedics, including upper and lower extremity disorders, injuries, and deformities · musculoskeletal infections · muscular dystrophy and arthrogryposis · sports medicine · spina bifida · synovial disorders · trauma · cerebral palsy and neuromuscular disorders · and more. Uses concise, bullet-point text with numerous charts, tables, and algorithms to expedite reference. Features a wealth of outstanding illustrations, original drawings, and clinically relevant radiographs. Offers lists of bibliographical sources at the end of each chapter.